This season has not been easy for Mikel Arteta. Despite Arsenal flying high five points clear at the top of the Premier League table, the Spaniard missed his side’s first four league games of the season, as well as the Gunners’ trip to Marseille. By the time the Arsenal captain returned to the squad, new (re-) signing Mathieu Flamini and ‘LANS’ Aaron Ramsey had taken the opportunity to prove their worth to the pre-season doubters and the former Everton man was suddenly no longer assured of his place. The latter, along with his seven goals and five assists this season, is also the league’s top tackler with 46 so far, while Flamini has quickly won the support of the Arsenal faithful. This feeling was accentuated as Arsenal fell to two home defeats in a row to Borussia Dortmund and Chelsea while Flamini did his time in the Physio room. Even in the (admittedly unconvincing) win against Crystal Palace, there were doubts expressed about the 31-year-old – who was controversially sent off – and his ability to keep up with the rigours of the modern game. All this just six months after Arteta was voted Arsenal’s fourth best player of the 2012/13 season. However, Arteta reacted in the best possible fashion with a man-of-the-match display against Liverpool in a game that was billed as Arsenal’s biggest of the season so far. The midfielder put in a true captain’s performance as he covered a huge amount of ground and made seven tackles and two interceptions, as well as a 94% pass success rate. 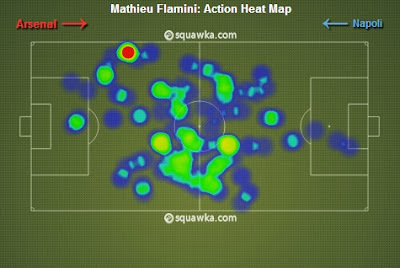 One of the main worries about the absence of Flamini ahead of the clash between the first and third placed teams in the league was Arsenal’s lack of cover on the wings. This is an area Brendan Rodgers has looked to exploit this season with his new 3-5-2 formation, with wing-backs helping to flood the opposition half whenever possible. But the midfielder – who started his professional career at Barcelona – adopted a deeper, more defensive role than he has been used to since signing for Arsenal on deadline day in August 2011. In fact, Arteta spent most of the game acting as a shield, sweeping across the pitch in front of the defence, similar to Sergio Busquet’s role at the Catalan club. Like Busquets, Arteta’s main duty was to stop the Liverpool midfield from supplying passes to Suarez and Sturridge – undoubtedly this season’s most prolific strikeforce. However, when the former dropped back from his starting position and drifted into midfield in an attempt to influence the game more, it was the Arsenal captain’s job to take over the marking and limit his ability to run at the defence or play passes into his strike-partner. In addition to his defensive duties, Arteta took it upon himself – as ever – to dictate Arsenal’s passing game. He was excellent at both spreading the play from deep (with three out of four successful long passes) and taking the ball forward himself to start attacking moves (with two successful take-ons). Arsenal’s anchorman summed up his game perfectly just before the 20th dropped back to offer help to his centre-backs before receiving the ball in his own half and moving forward thirty yards to play in Bacary Sagna. The right-back’s cross found Santi Cazorla and the Spaniard – at his second attempt – finished off what his countryman had started. Next up for Arsenal is Borussia Dortmund, where Arteta will have the chance to prove himself against a better set of players but will know he can lead the club through another tough fixture as the team looks to build confidence heading into a vital month.